Boooo! As it’s Halloween and everything I decided to get into the spirit of things with a little Minecraft; but not any old Minecraft. There was a new mod pack thingy released a few days ago and it was featured on the Minecraft forums which is how I found out about it. As the title suggests it’s called “The No-Holds-Barred Halloween Mod” and you can find it here. It basically adds a load of Halloween themed goodness to Minecraft. I don’t really know much about it at the moment because I am hoping to find out more when I play. So enough chit chat, let’s get playing! Hmm, not really a good idea to jump over there then . . .
After surviving the first night in my temporary shack I went off to reap from the land (or chickens and sheep to be more precise) and came across a ravine. After dgging down into it to get some iron I tried jumping back across to the top and fell in leaving me with 2 hearts. Luckily I had a lot of dirt from when I was leveling out the terrain for my house. A minute later and I was back home. Damn. Damn, damn DAMN! So the server crashing the other days caused the map to become corrupted. So we have a new map now. Brilliant. So I might put up a post or two in the next week, I’m going to be starting a new lets play (possible a video one) when Notch freezes Minecraft development on the 18th and just concentrates on optimization and bug fixing until Nov 18th. 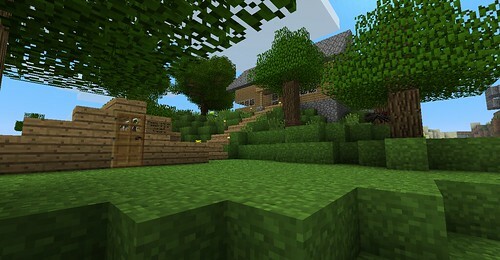 This is so that the game will be ready and bug free (hopefully) for its release at Minecon. 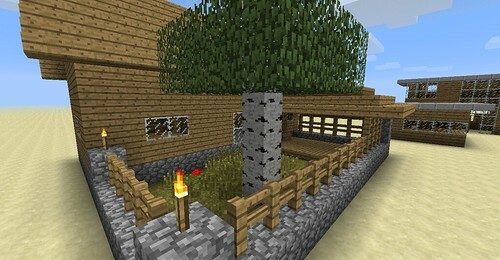 But to keep you occupied until I get a post ready here is a piccy of our house on the new server . . .
Ok, long story short the mushroom water feature thingy I build was starting to annoy me so I destroyed it, made a new mushroom and then made it a water feature. So I think it is looking quite good so far, unfortunately I seem to have run out of sand. Luckily there is a desert about a minute from here. Let’s go shopping (for sand, which is free. 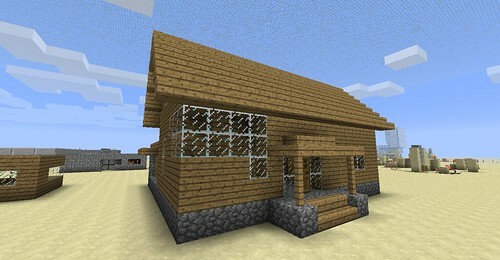 Cause that works) One day and an iron shovel later I’m exactly 100 blocks better off in sand. Back to work then. So, after a few days of ‘End of stream’ errors the server finally decided to work again. Back to making this village . . . First job – extend the pond into a river. After a day of long hard work I went to bed in our bedshroom and and came back down to take a picture when it was day again. Then a second after I took that screenshot “ssssss” and boom. Luckily I slept at the village this time so I didn’t have to walk all the way back. So yh, back to work. I’m going to make the river bottom all sand (cause it looks nicer) and yet another day passes, job done. My shovel also seems to have taken a beating and need to be repaired. 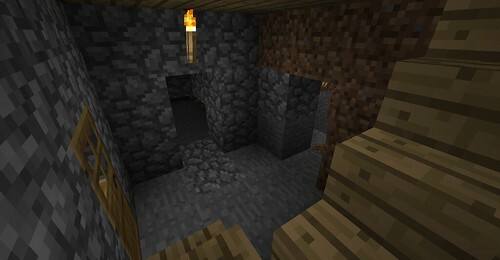 Another trip back to my house it is then (my diamonds are stowed away in my basement) but I think I will be fine with an iron shovel for now. I’ll try and get a few posts ready in this session so that I still have some stuff to post over the next few days if the server goes down again. So until next time, keep crafting! So yh, sorry about the lack of posts in the last *runs off to check when last post was* 10 days. 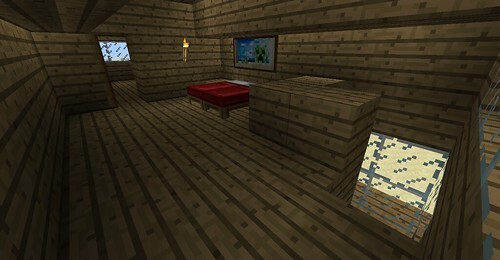 I’ve been occupied with Bad Company 2 quite a lot and I’ve been going out with friends a lot more recently (we finished school yesterday so I should have some more time on my hands from now on) But I haven’t been ignoring Minecraft, just not posting anything about it. Today’s post is going to be a kind-of overview of the stuff I’ve built on the new server map over the last week or so. 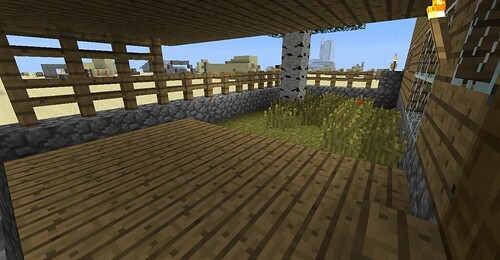 This is my “base area” I suppose you could call it, my house is atop the hill and the building to the right is an automatic wheat farm. The house I built is the same house (with a few changes) as the one I showed in my last post. I’m not going to show off the insides, if you want to see what it looks like just go to my last post. 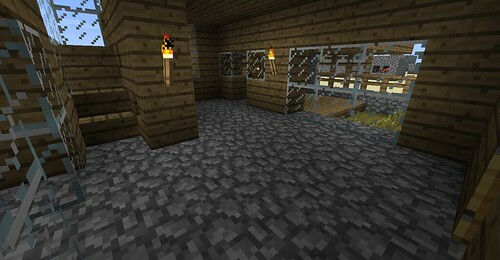 Downstairs is a small mushroom farm, with a mineshaft in progress on the right and an idea from Iced_Apple on the left – a tunnel sysetem joining all of the houses in the area together for easier access at night for example. But that is still being constructed, I might show that in another post when it is finished. 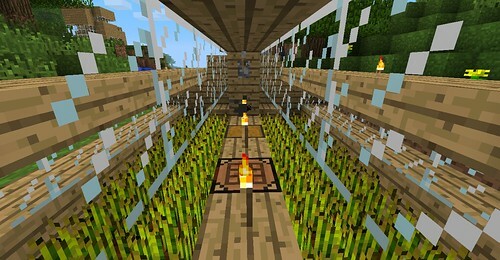 And finally my wheat farm, it is automatic and rather stylish if I must say so myself 😀 To harvest you just have to flick the lever, this opens a piston which lets water run down the channels of crops and harvests them. It then pushes the wheat and seeds down to a collection point next to the door. So here is the house I was talking about yesterday, sorry it’s a bit late – I got Bad Company 2 so I’ve been playing (and sucking) on that over the last day or so. But anyways . . . 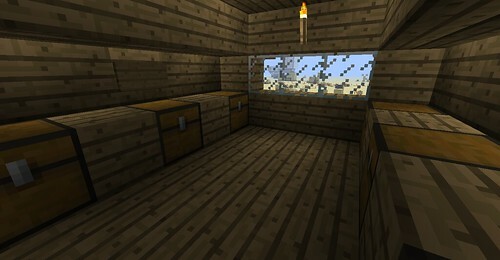 The Outsides of the house are pretty boring at the moment, but it will probably look better in place on the server. Inside there is room for a couple of chairs or something and then the kitchen is off to the right . 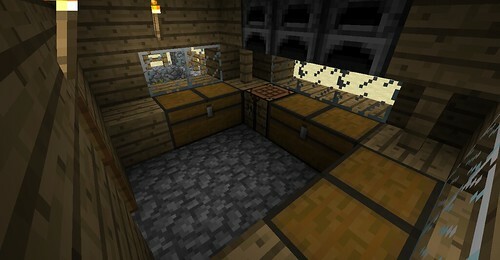 . .
Upstairs is the bedroom area and a storage room as well, with chests to put specific items in. 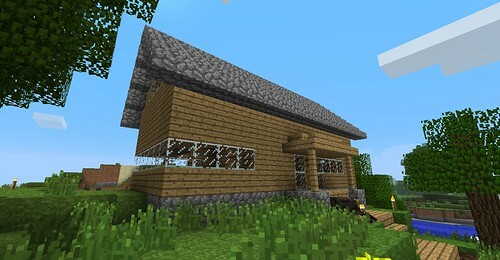 Hope you enjoyed looking at this house and I hope to be building it on the server soon . . .